Well, here's a project that I've just finished the initial assembly of. A very clever Finnish fellow named Jesse Tuominen came up with the idea of creating a side rail sub-chassis for the MR03 and making it available at Shapeways. Arch2b first posted about it (to my knowledge) here. The design looks very promising because it gets rid of the wacky H plate that the factory rear suspension is based on and uses the idea of side rails like larger scale cars (and the MRCG) for more consistent steering behavior. I decided to do an MR03VE build based on Jesse's chassis, but wanted to stick with the stock kingpin-style front end, which has always worked fairly well IMHO. Jesse's designs had been based around the PN A-arm front ends, but he kindly drew up a version based on the stock front end and made it available to me as a beta to play with. 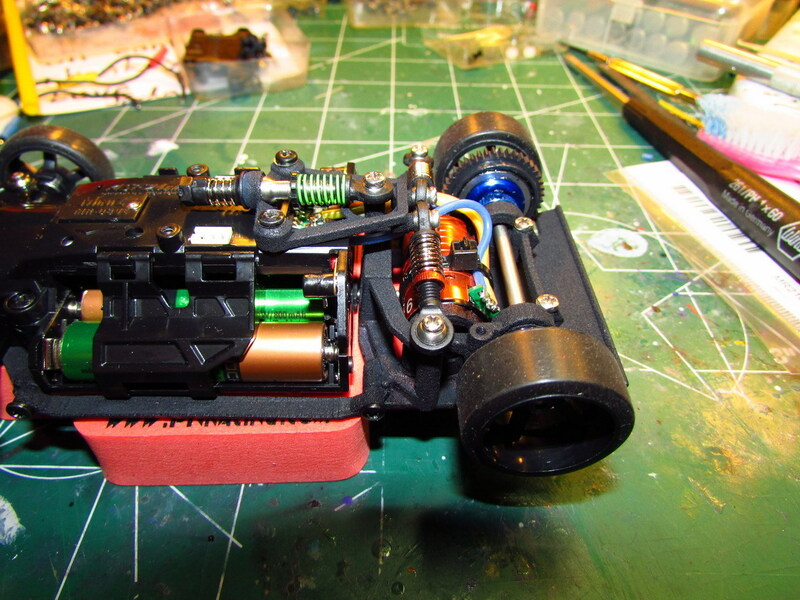 First, a couple of words about the chassis itself. 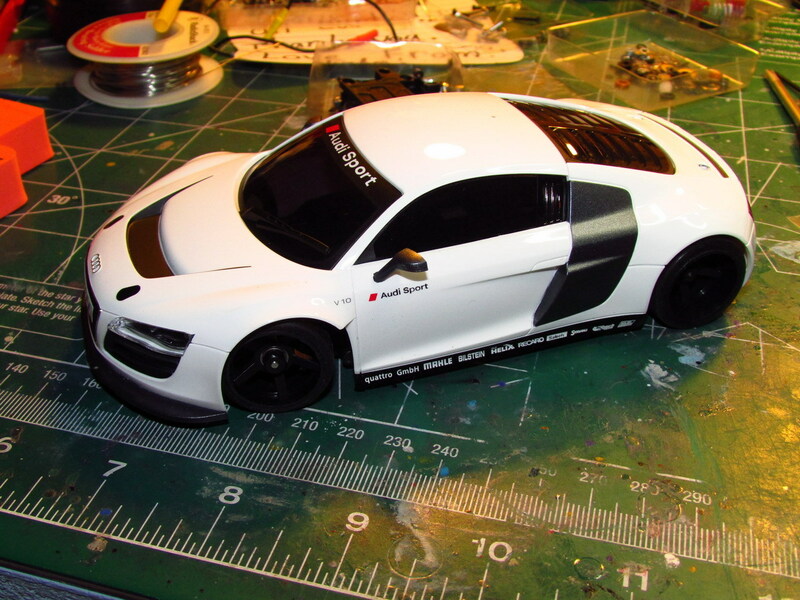 When you order from Shapeways, you have the option of ordering in white or black. Black is a bit more expensive, but looks cooler. Or so I thought... Actually, the black finish is not at all smooth, and the piece is really just the white printed material sprayed with some black grainy material which is not ideal for this type of project. After I cut it apart, I was soon scrubbing off all the parts with a toothbrush to knock off the dust and try to smooth it down a bit. Further scraping was required where parts joins were made to assure a good fit. This added considerably to the preparation time, and I would probably go with the part in white if I had to do it again. Overall however, the parts themselves are pretty amazing it terms of fit. The kingpin balls (which I was a bit worried about) pop smoothly in with excellent movement, and are retained nicely under tension by screws. All parts have really excellent fit right out of the box for this kind of medium, and the design is clever and well thought out. I was very impressed. 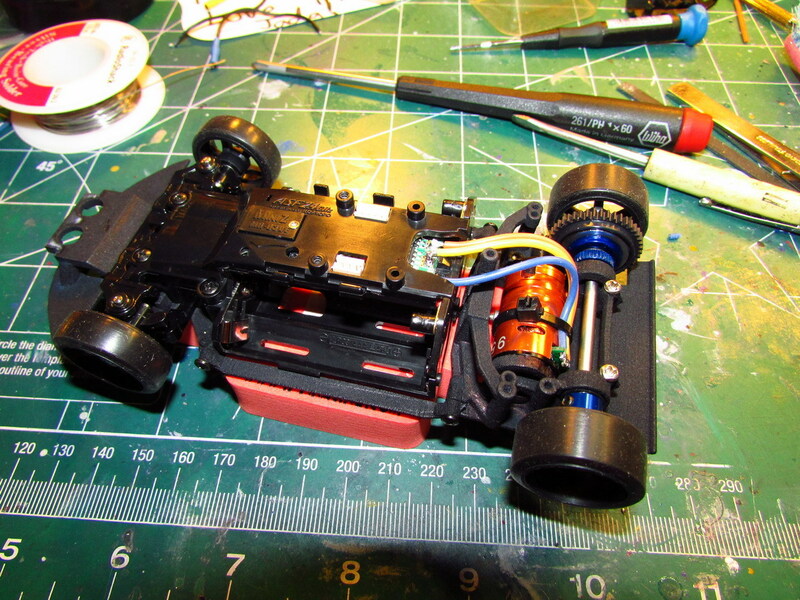 I did have a couple problems, but nothing terrible, and keep in mind that this particular version of the chassis was a beta, and Jesse continues to improve these parts. 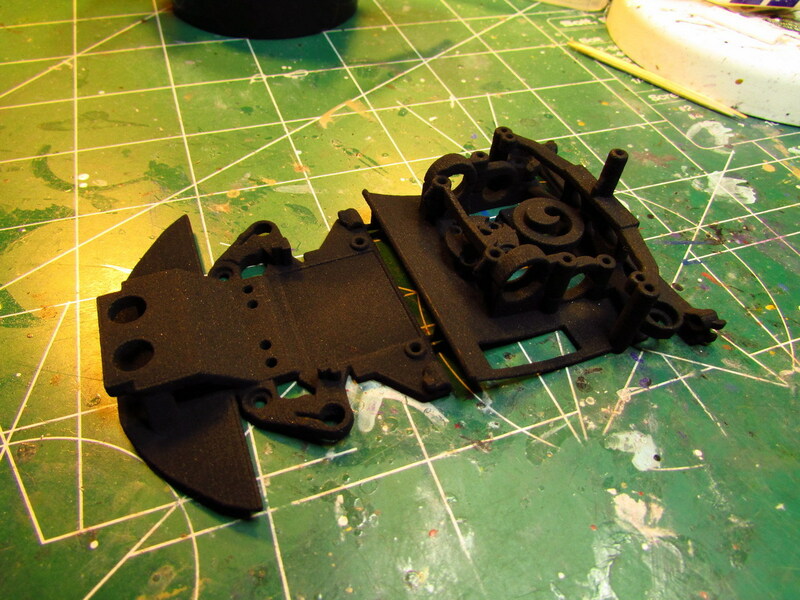 Here are the constituent parts cut apart, cleaned up and laid out to show the overall design. It should be noted however that the triangular shock mount shown in the middle was not included in the chassis and needs to be ordered separately to complete the car. Maybe this necessary part could be included in the chassis parts in a future revision to avoid confusion and extra expense. Another point is the detachable side rails. Earlier versions of Jesse's chassis included the rails as integral parts of the chassis itself and they look considerably beefier. These look rather fragile to me, and I'm hoping that they're not an early casualty when I bring the car to the track. Another improvement to the chassis might be the inclusion of a spare set of side rails. The detachable rails do modularize the design in a desirable way, but take extra time to prepare to ensure a good fit. They can be seen in the picture above to the extreme left. 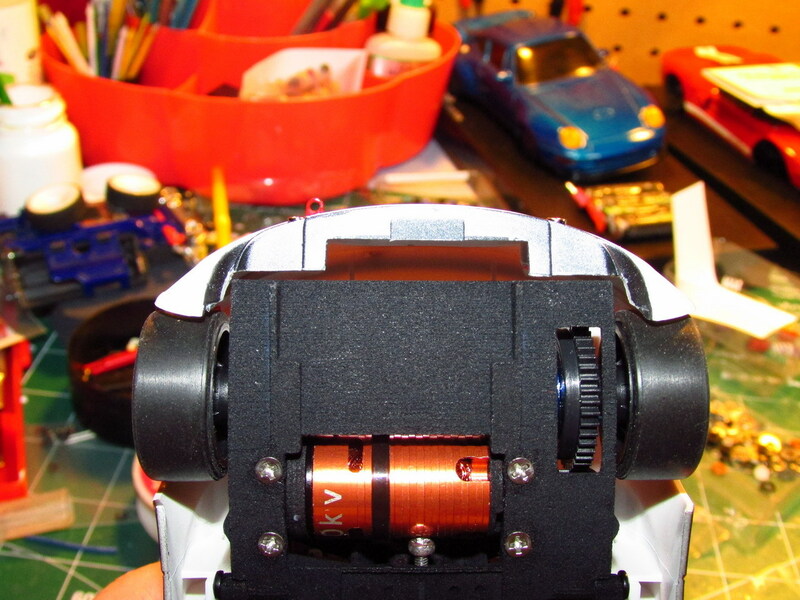 After finishing the front end, I moved on to sorting out the motor pod. I used a 3Racing diff with a PN 64P spur and pinion and had some troubles getting the motor turned enough with the circular cam end pieces to get a good mesh. As you can see here, I ended up needing to grind a bit off to get the motor rotating enough. These pieces might do with a bit of modification to allow more rotation of the motor in future revs. You can see the white printed material where the black coating has been ground off. Nothing a black sharpie won't fix. This next (awful) pic shows the machine screw I used for the motor pod's gimbal pin. I just filed the end round and threaded it in from the the opposite side, figuring I could adjust its length later if required. Believe it or not, there is actually clearance for the motor with the length, although I should probably go 2 mm shorter. I used machine threads wherever possible in this project, and the chassis requires both cap head and countesunk screws in various lengths. Many of these I didn't have readily to hand, so I went to boltdepot.com, where they had everything necessary for very reasonable prices. Their shipping was extremely fast too. As mentioned, I've not yet fully adjusted the suspension to my liking, or tried it on the track, but hope to be able to do that over the holiday break and will report back here after doing so. Last edited by ianc; 2014.12.19 at 04:52 PM. that is interesting design and pretty cool chassis. -the black color is not a coating, but a dye. The parts have the same "matte" appearance in white as well, but the only issue with the dyeing process, is that it makes all the badly cleaned and remaining powder to stick. -I've always gone myself with the Atomic side shocks myself and for my builds. These have a raised ball, that don't put the side shocks at such an angle that it would push the center tri-damper mount up at all. Perhaps you could also raise the outer balls a little with spacers to get them more level. -The center shock ball has not snapped into its place at all. -All the shocks look totally dry. The damper grease of 5000wt or 15000wt thickness is essential to keep the rear wheels 100% on the track and not hop about. -I've always used the 126dp gearing, but I've now noticed that with the 64dp gears, you can find such gear combos, that you can run out of the adjustment range. Grinding a little more travel is easy, but you can also move the rear axle a little forward if you wish. -The center pin with threads on looks dangerous. I don't know if you can get a smooth free movement of the rear end like that? It is of extreme importance that everything in the suspension moves absolutely freely without and binding. If something binds, some polishing and prepping is needed to get all fitment perfect. This is a build that needs some preparation and tools to get everything right. The first thing I always do, is drill all the screw holes open with the correct size bits. Then all the suspension ball fitments are reamed to the correct size and fit. The key features why this has been so effective in racing and taken already numerous wins and track records in modified, is the weight and its placing. 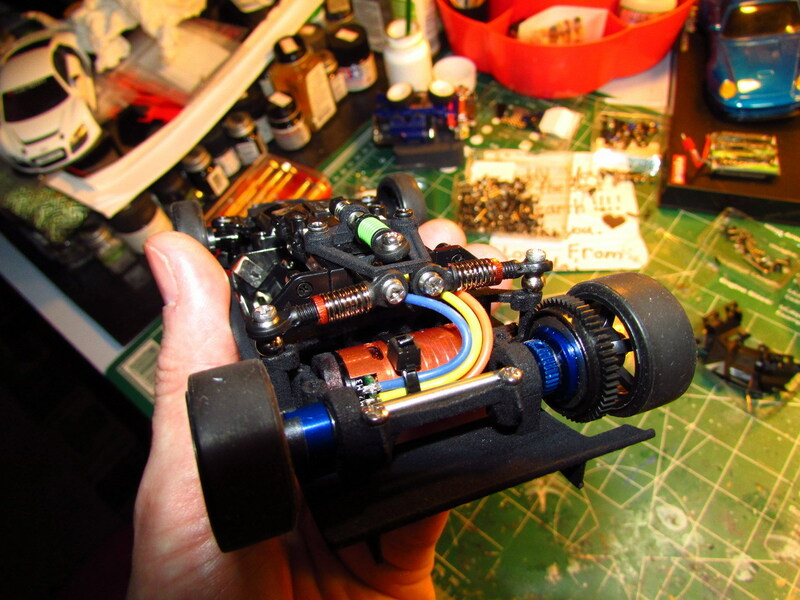 You can build a mod class race car to around 155g ready weight quite easily. Then when you have the liberty to place a total of ~20g of tungsten under the car to get the center of gravity even lower, the car gets to another level. Then it's possible to run very aggressive tire combinations and not upset or traction roll the car. PS, do you have the assembly instructions? I attached page 5 to show the pin assembly. Thanks a lot for the post and the tips! The beefier side rails do sound interesting. Would they work with this particular chassis, and can I get a set somehow? 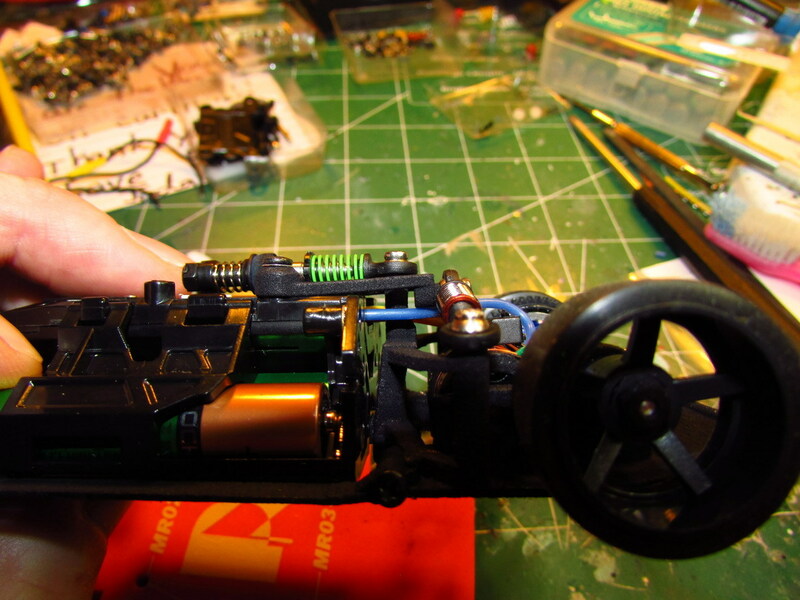 Great idea on shimming up the outer balls of the side shocks (duh!). Here I've used a couple of stock MR03 upper kingpin balls, which were all I had laying around and they seem to have significantly lessened the deflection. I'll try to find some aluminum or brass tubing of the right ID to take an M2 screw and get it fitted, as the balls are still a bit short. I still think a larger strengthening rib on the side of the shock mount would be a good idea though. Another change you'll notice I made was to remove the thin rib to the right of the spur gear; removing it allows the diff to be removed without unscrewing the entire motor mount and upsetting the mesh. I've never been a big fan of using grease or oil on shocks before as I haven't had too much trouble with wheel hop, and it just seems to create such a mess. I added a bit here though on your recommendation and it seems to have firmed up the rear a lot. Almost too much; I may have to go to a softer spring back there now. Thanks also for the tip on the center shock; I hadn't even noticed it was supposed to go in further. I gave it a push and it popped right into place. The gimbal pin screw seems fine to me actually. I think the lighting in the pic is overemphasizing the depth of the threads that are remaining. I filed them almost all the way off to create a hemispherical end and the movement is very free in all directions. I'm sure it will not work as well as the gimbal pin pictured in your attached instruction sheet however. I was very interested to see that sheet, as I didn't know any instructions existed! I would be very interested in obtaining the full document if you could perhaps send it to me? I'll PM you my email address, and if you could send me a copy, I'd be much obliged. I do agree with your treatment of the screw holes. I ran the correct size drill bit down all the holes first, although not many of them needed it. I then like to coat the threads of a screw with oil and turn it down slowly a few turns, then back it out, as if the screw is a tap. Also, one must resist the temptation to overtighten these small screws; a lot of torque is really not necessary in my opinion! Thanks again for your help, and happy holidays to all! Last edited by ianc; 2014.12.23 at 10:18 PM. >>> Do all the "v6" sub chassis have the new detachable side rails? 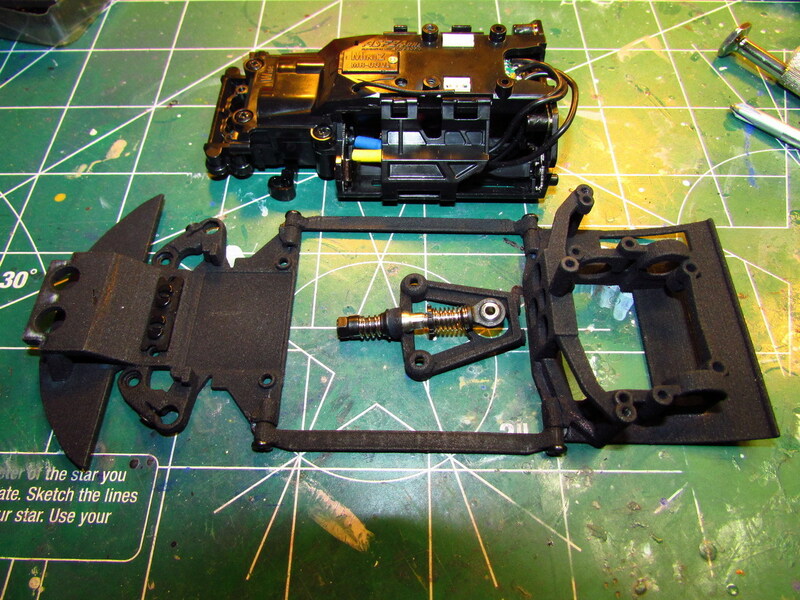 The Shapeways website description and pics don't show detachable side rails on the complete sub chassis "v6" sets. All the revisions thus far have looked great.. 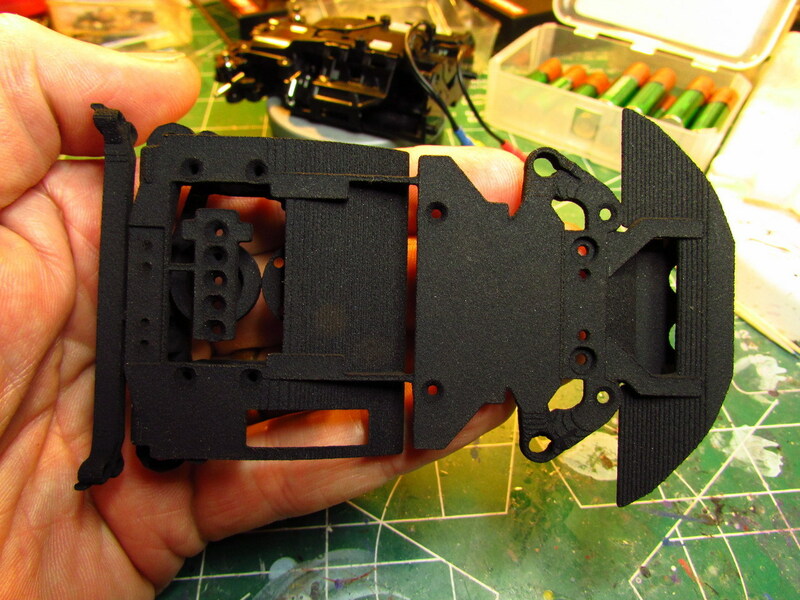 I know these sub chassis' designs are constanty modified/upgraded - Which I love, BTW - And I'm just curious, If I place an order now (One month later since ianc's build) what design or "version" v6 sub chassis I will receive? 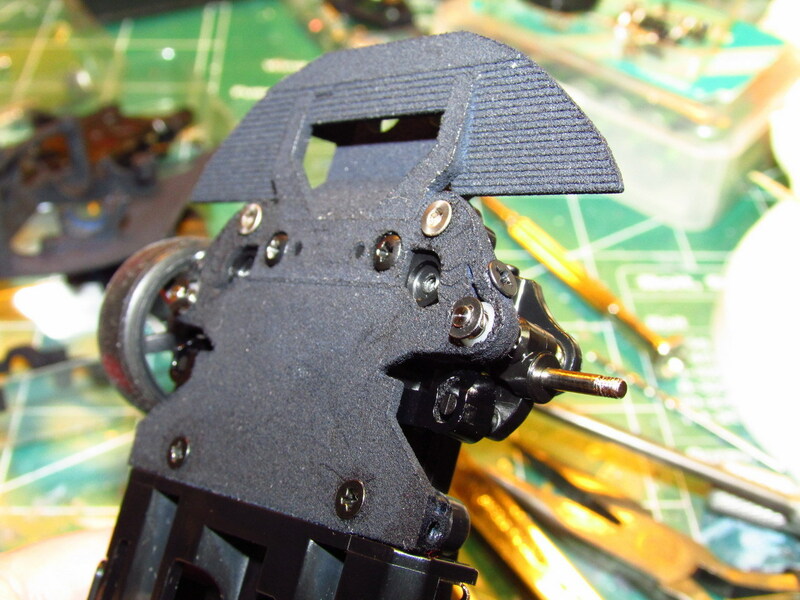 Then the parts will be available readily prepared, checked and with the needed screwset. All the three mentioned changes have been done, and much much more. The rear sets come now with two sets of motor cams. 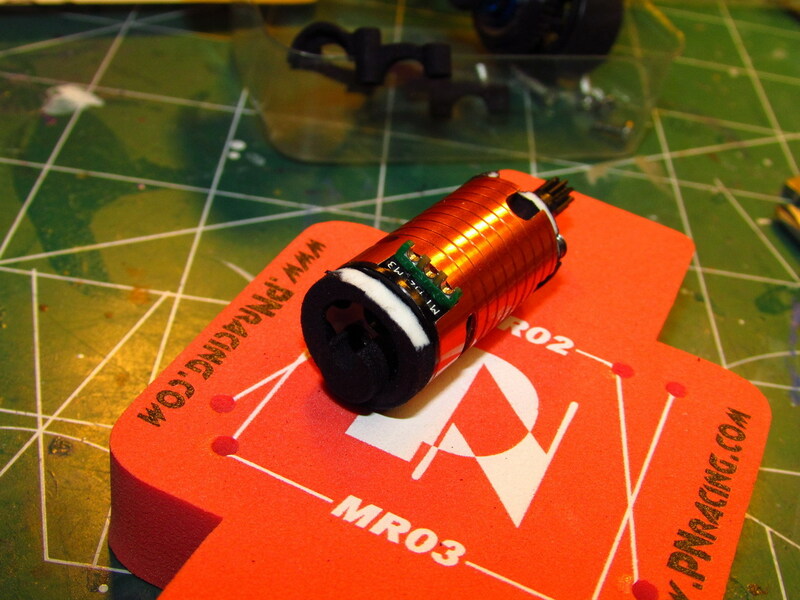 One for the brushless motors and another set for the brushed motors. Also, the standard front will be realised in a completely different way. 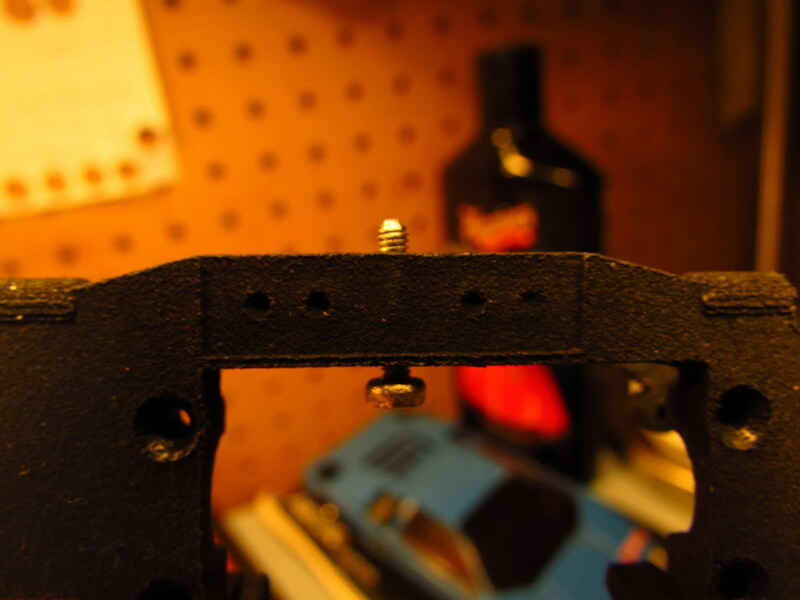 There will be a front suspension "monoblock" for the standard suspension just like the JRP double A-arm monoblock. So, changing between different readilybuilt suspensions or changing between A-arm and standard can be done in seconds without completely rebuilding the whole front of the car. The sidelinks are beefed up and changed in design. All the screws are angled now to provide more clearance for the front tires at maximum lock. Please take a look at the more or less final prototype car the picture of which is attached. ^ Awesome job Jesse! Thank you for the detailed reply! 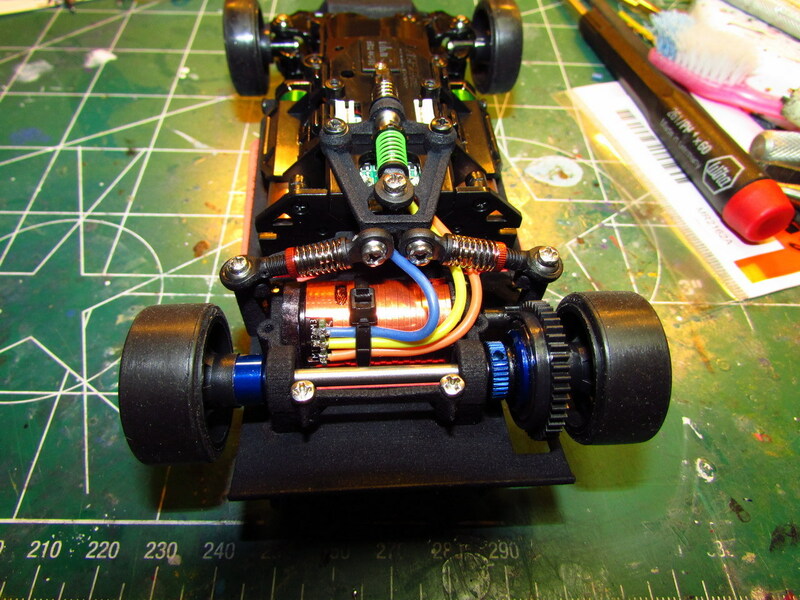 The v7 sub chassis looks GREAT. I will have to try. Thanks again & keep up the great "homegrown" work! The detachable rails do modularize the design in a desirable way, but take extra time to prepare to ensure a good fit. They can be seen in the picture above to the extreme left. And how 'fragile' did the side rails turn out to be?